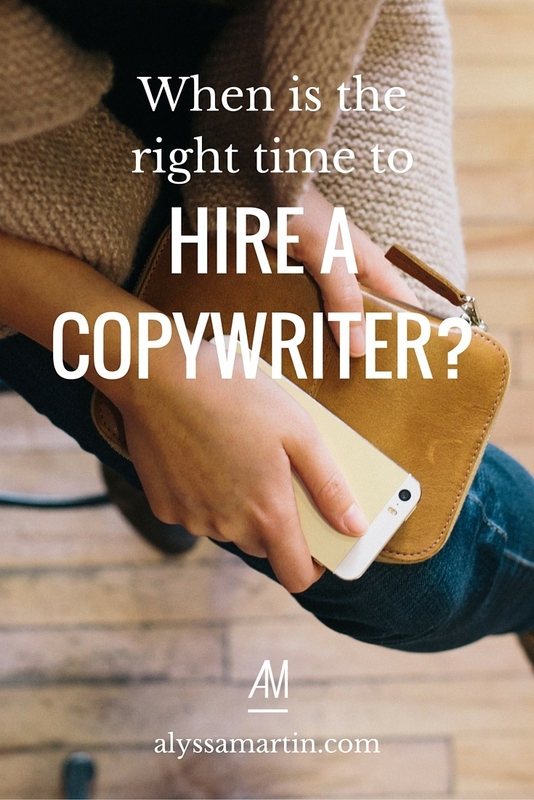 When is the right time to hire a copywriter? You take great pride in everything about your business & your brand. You want everything to be perfect, which means you’re always looking for things to improve. Sometimes that means investing in a professional & other times that means learning how to do it yourself. So how do you know if you should be tapping out on your keyboard yourself or outsourcing your copywriting? Your website is a business tool – a marketing device. You’ll get the most out of hiring a copywriter if you know what you want your website to do for you & how you want it to achieve your business goals. Support your upcoming launch & increase sales. A copywriter writes words that compel your website visitors into action, so you need to be clear on what precise action you want them to take & how that action strategically supports your business goals. Make sure you understand the strategy behind the words written on the page. No amount of clever copywriting will ever make you more sales if there’s no one seeing the copywriting. You need to have a marketing strategy in place so that you know how you will be driving traffic to your new copy. Without that strategy, your web copy is like the proverbial tree falling in the forest. If no one sees the copy, does it really exist? And if no one is really sure your copy exists, it’s probably not a good investment for you. So you should only hire a copywriter if you have a marketing strategy in place to make sure you get eyeballs on your website & on your copy. If you don’t know your dream clients are, no words your copywriter writes for you will stand out. You need to know your potential client’s awareness & sophistication before any good words can be written. This is Marketing 101. Always know who your dream clients are. Because if you don’t know who they are, you can’t attract them. Your business is your baby. You clearly think it’s special, but it can be easy to get too caught up in that to notice how your audience sees your business. It’s really hard to objectively look at your business when it’s so personal to you. Maybe you struggle to see your business from your potential client’s perspective. That means you might not know how to figure out how the features of your service benefit your clients. An outsiders viewpoint might be exactly what you need. All good copywriting is about persuasion. You can be a good at writing, but still not be a good copywriter. Because writing a novel & writing a persuasive piece of copywriting are 2 different skills. One is right brain. The other is left brain. If you’re not good at persuasion or left brain thinking, it could be costing you the chance to land clients through your website. That’s where a good copywriting can make a big difference to your business & its bottom line. Copywriting is nuanced & can take up a lot of your time – time that you’re not spending with your clients. Don’t let yourself waste the next 9 months trying to squeeze in writing your web copy around all your other responsibilities. Procrastination can be costly. Imagine that it’ll take you a whole week to write your web copy – because you’re not sure what to write or how to write it, plus general procrastination time. That’s 40 hours of your time. And what’s your hourly rate? Let’s assume it’s $150. That 40 hours spent on your copywriting is actually costing you $6,000. Compare that to hiring a copywriter. Imagine your most popular selling package costs $3,000. That means, your new web copy only needs to attract 2 new clients through your website in order to break even on your investment. Suddenly, hiring a copywriter seems a lot less risky, right? Suddenly, it seems like a sweet deal. Typically, when you hire a copywriter, you need to have your brand messaging organised before you hire them. It’s a misconception that if you hire a copywriter, they’ll create your brand message for you. You need to know what you want your brand to stand for & what your core business message is, so that your copywriter can transform that into words that will get attention from the right people. A great copywriter can help you create an amazing copy, but it’s not their responsibility (or often their skill-set) to help you define your message. Luckily, I help you do both. If you’re in this zone, it’s definitely not the right time for you to hire a copywriter. As you experiment with your business and take risks with your writing, your writing style, brand values & services will inevitably change. I highly, highly recommend that you wait until you’ve established your writing voice, got clear on your services & know who you want to attract before hiring a copywriter. They’ll be able to write in words that sound like you, because you will have figured out your own distinct style. I totally agree that your business makes a wonderful & impressive contribution to the world. But it’s your responsibility to make that crystal clear to everyone you meet. A copywriter can’t do that for you without some input from you. Good copywriting requires thoroughly understanding you and your business. Because writing without a factual basis is called fiction. And businesses that market based on fiction end up in court. If you’re just looking for a pencil pusher to write what they’re told, you’re wasting your time hiring someone with years of expertise & hard-won credentials. You’ll miss out on all the ways their experience can help you grow your business with strategic ideas & new insights. If you’re going to hire a copywriter, you need to respect their expertise & trust the advice they give you is backed by serious experience. If you’re not willing to do that, just write it yourself. It’ll save you both a lot of hassle.